Each one of her books has characters that are so bold and flawed that it creates real life lives that jump off the page and that are so real. I do not know how she does it but some of her characters have become close friends to me so that I want to revisit them in the book. Very nerdy to say that but it's true! But one that I have noticed is that the location of her books becomes one of the main characters. Whether it is Paris in 1946, the Alaskan bush in the 1970s or a road where two girls become best friends in the early 1980s; Hannah makes sure that the reader knows how important the backdrop of the story is and how it interweaves into the fabric of the story. 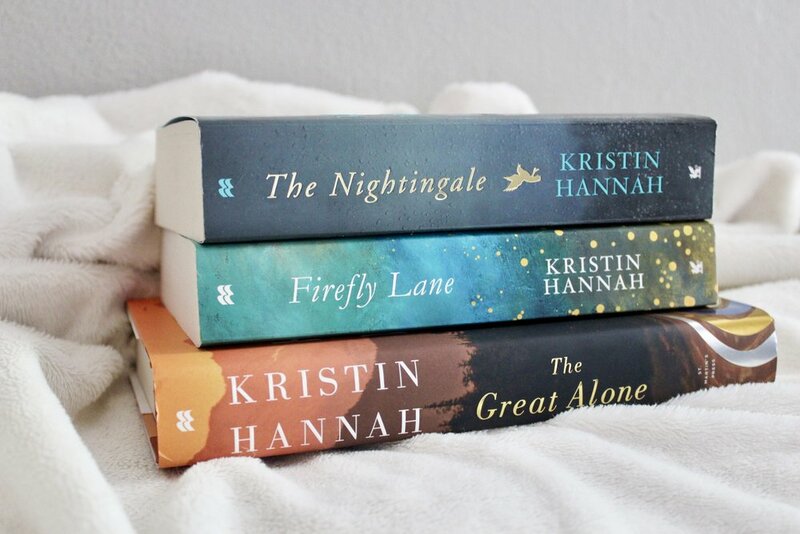 The three books that I have read from Kristin Hannah. I never considered myself a historical fiction fan but the Nightingale has made me fall in love with books set in the WWII time frame. So much so, that I know have read 3 more books in this era. Hannah's creation of characters is really something special because she really focuses on the connection between all of them. Each character is flawed but I think that is really the beauty of this beloved story. There is a reason why this book was the 2015 book of the year. It is gut wrenching tale of love and war set in Paris, the French countryside and the harrowing details of a concentration camp. The Great Alone was a book that really surprised me with how much I liked it. I was not really interested in reading about the Alaskan bush because I could not connect with the subject but I wanted to read it because of how much I loved the Nightingale. The mother/daughter connection in The Great Alone is outstanding. It is about unconditional love, understanding, forgiveness, and patience. This book stayed with me after I read it because of the depth of love that was displayed by Leni in all aspects of her life. The Great Alone out in the wild. The most recent book that I read by Hannah was Firefly Lane. This is an older book and it was a book that is beloved by her fans and I can see why now. It is a story that spans 4 decades that tells the tale of a friendship of Tully and Kate. By reading this story, it really shows that friendship can be work and can be the most important person in your life. There is a special connection between the two women or as everyone calls them "TullyandKate." They experience high school, college, their first jobs and marriages together & it solidifies their friendship. But along the lines of miscommunication, frustration ensues and the friendship fractures. But it is Hannah's master storytelling of how these two women make sure to be in each other's lives because they need each other and it is an amazing story to experience. So I am curious to see and hear what you think of Kristin Hannah! Have you read any of her books? I would love to know what you thought of these books or if you have any recommendations for me.